Sols 2311-12, February 4, 2019, update by MSL scientist Roger Wiens: The accompanying image shows the target “Brent” in the lower right corner; it was analyzed with ChemCam and APXS, and imaged with MAHLI over the weekend. It is a rounded pebble roughly an inch (2.5 cm) in diameter. In spite of the fact that it has been rounded by mechanical abrasion, it still shows faint layering. You can also see inclusions that are partially filled with brighter material. 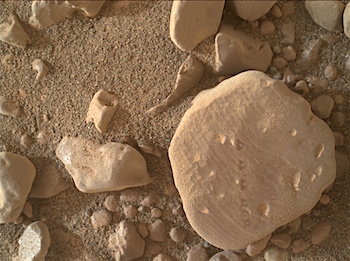 Marching vertically across the face of the pebble are five laser pits from ChemCam. The bottom of each pit has a telltale whitish appearance. This entry was posted in Reports and tagged Aeolis Mons, Brent, CBU, clay-bearing unit, Crawton, Curiosity, Elgol, Gale Crater, Isbister, Knockfarril Hill, Magnus, Mars Science Laboratory, Mount Sharp, MSL, Murray Formation, NASA, Vera Rubin Ridge. Bookmark the permalink.